Battersea's battling MP Jane Ellison gets it organised with her megaphone! Jane Ellison, Battersea's battling MP spent Tuesday with the "Broom Army" of Battersea, helping local people to organise the clear up. 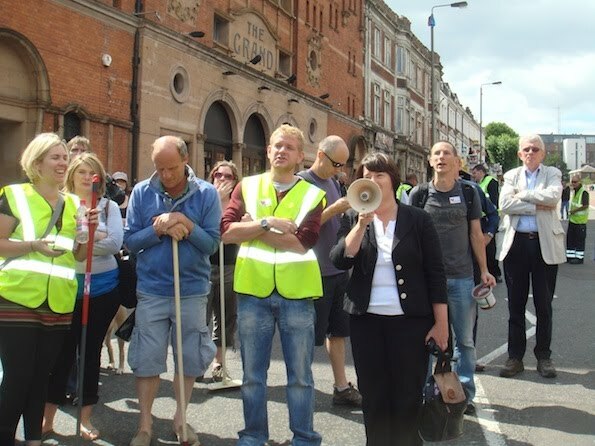 Picture Below: Jane Ellison keeping the the broom army updated with help from her megaphone, accompanied by James Walker (in yellow top to her left), who had come over from Clapham Town to help out after being caught amidst the riots whilst visiting a friend the night before. James ended up as a key organiser of the community who turned up to help - a real case of the 'Big Society' that has always existed and emerges from the people at times like these. "The local MP, Jane Ellison, was having none of it and hit the phones. She solved the problem before the cleaners became rioters themselves". This was a very accurate report - the brooms were getting somewhat frustrated at not being used, so it was great when Jane organised the opening up of St John's Road for the battling Brooms of Battersea to be let loose on. Within a short space of time it was well cleaned up!